Sharks continually shed their teeth, and some Carcharhiniformes shed up to 35,000 teeth in a lifetime!. In some geological formations, shark's teeth are a common fossil. 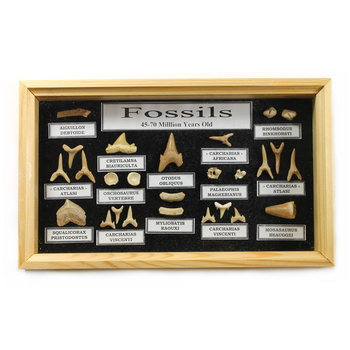 These fossils can be analyzed for information on shark evolution and biology, especially because the teeth are often the only part of the shark to be fossilized, in fact fossil teeth comprise much of the fossil record of the Elasmobranchii, extending back hundreds of millions of years. They are the preserved remains or traces of animals plants and other organisms from the remote past. A fossil normally preserves only a portion of the deceased organism usually that portion that was partially mineralised during life such as the bones and teeth of vertebrates or the chitinous exoskeletons of invertebrates.